The two central themes of the Apostle Paul’s letter to the church at Ephesus were unity and Christian maturity. At its core, the Christian Unity Movement is simply a high-powered, grassroots discipleship movement. One of the primary reasons that disunity exists within the Body of Christ is that the Christian church does not have one common discipleship curriculum for all believers… THAT IS UNTIL NOW! As we approach the end of the church age… the Christian church will see a rapid increase in the number of new believers brought into the kingdom of God. This will not only require an increase of minister and ministries, it will also require a support staff of mature believers that will be able to carry a burden that was never intended to be able to be handled by one person. (See Deut 1:9-18). However, time is the one thing that will not be on our side. Therefore, the amount of time needed to bring believers to a place of spiritual maturity will also be drastically reduced. Therefore the church will be in need of teachings that will facilitate rapid spiritual growth so that the body of Christ will have the infrastructure necessary to handle a rapid influx of new believers. Steroids are hormones and/or androgens that specifically designed to promote accelerated growth and strength to the physical body. Just as steroids are specifically designed to promote accelerated growth and strength, the “Unifying the Body of Christ” book series was specifically designed to promote advanced and rapid spiritual growth in the spirit man by isolating and targeting those teachings necessary in order to bring a person to spiritual maturity and as a result, bringing the Christian church to a place of unity. The “Unifying the Body of Christ” Book and video series covers the topic of spiritual maturity from start to finish. This curriculum takes 4500 years of biblical world history and nearly two decades of Bible College teachings and consolidates and condenses them into a clear and concise 3-book series. If your sole focus is accelerated spiritual growth, this book series eliminates much of the noise, clutter and distractions that are in the Christian church which do nothing more than distract from focusing and concentrating on just those things that promote spiritual growth and maturity. *Steroids are classified as a drug and are only legal when prescribed by a physician. Studies have shown that what appears to be the positive short-term benefits do not outweigh the drugs long-term negative side effects. This article is in no way intended to promote, encourage or otherwise advocate its use and was simply used for illustration purposes. America’s Founding Fathers created a government that would ensure a society of freedom, peace, prosperity, liberty and happiness. From the 1920s-1960s, a civilian army whose allegiance and loyalty was to a hostile foreign power infiltrated our nation. For the most part, these enemies of the American republic have gone virtually unnoticed by the American people. Yet, these individuals have caused the virtual overthrow of the American system of government. As a result, the American government has become the same type of tyrannical government that our Founding Fathers fought and died to destroy. The result is a society and a culture that is crumbling under our very feet. __America is at war! However, this war is not being fought on some foreign soil with tanks and planes. It is being fought here at home. We are fighting a war in defense of our homes, our families, and posterity. This war is being fought in our courts and it is being fought in our schools. I am not referring to a war against terror, but a war for the very soul of America. It is a war of ideology and it is war for the very future of this nation. 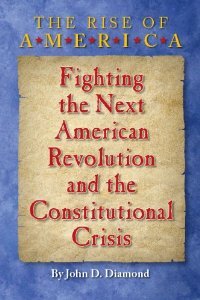 John D. Diamond has written a book that answers the question that many Americans ask, “What has happened to this country?” Through extensive historical research, the author shows the pivotal points in U.S. history where the power of the American people to control the government has been taken away and replaced with a system that the founding fathers would have rejected. This is a brilliant analysis of history that leaves the reader face to face with the challenge of a new revolution to take back the country to its original Christian foundations. Simply put, buy it, read it, you’ll be enriched by the experience. The Christian church is on the verge of the greatest outpouring of God’s Spirit that the world has ever seen…For we are the generation that will witness the manifestation of His glory. Yet at present, much of the church is doing very little to prepare for it. There is a popular teaching that Jesus Christ could return for His bride (the church) at any moment. Scripture however teaches that there are several things that must first take place. John declares that Christ will remain in heaven until the bride has made herself ready. Peter taught that Christ would remain in heaven until restoration of all things. While much of the church is standing around looking up into heaven awaiting Christ’s return, there is still much work that needs to be accomplished. Christ will not return from His place in heaven until biblical unity has been restored to the body of Christ. 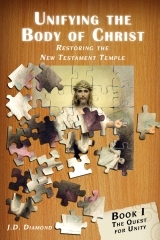 The Christian Unity Movement and the book series: Unifying the Body of Christ – Restoring the New Testament Temple prepares the way before our coming King. Pastor Blair Blakeslee believes it is essential to have a growing and developing relationship with Christ. There is no better way to do that than spending alone time with God. Don’t get me wrong; we can also grow when we are committed to our church and while we fellowship with other believers. But God is yearning for a relationship with us. This devotional book is designed to help you develop quiet time with God and to help you put your faith into practice. I’ve read a lot of devotional books with great truths, but they never gave practical examples on how to live out what I learned. After DOING these challenges, you will find that your life will change and many other lives will be impacted. Blair Blakeslee writes this book from years of experience with youth ministry, hours of study of the Scripture and a heart to change a generation. 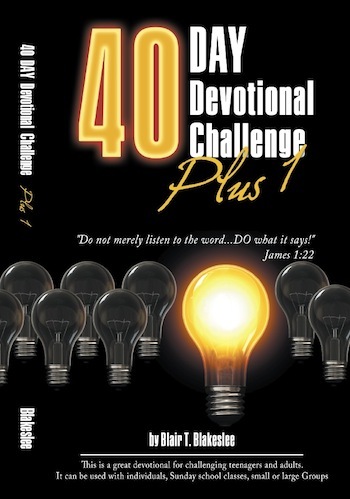 You will be challenged and changed through this 40-day devotional!